After the file is uploaded it will begin processing. Larger uploads can take some time. While the file is processing you will see the status as “Pending.” Once the file is done processing, the status will change to Complete and a results file will appear. This guide will tell you how to read these files & use them to assure everything processes as you'd expect. Even for experienced users, it's important to check the results files after you do a bulk upload to make sure that everything processed as you expected. 4. Click the second blue “Download” link to get the "Results File"
The file will download to your downloads folder - locate it and open it in a spreadsheet application such as Excel. Action - This tells you what action was performed on the product in the bulk upload file. Guid - (could also be ID or Sku depending on the identifier used) This tells you which product the action was performed on. Errors - If there are any critical errors (the kind that would prevent information from being saved, or a new listing being created on any channel) they will be placed here. Messages - This is where an additional messages from the channels will be, such as Warnings - these should not stop your listings from going through, but are important to address. Notices - Notices are all other messages, usually from SureDone, are placed here. 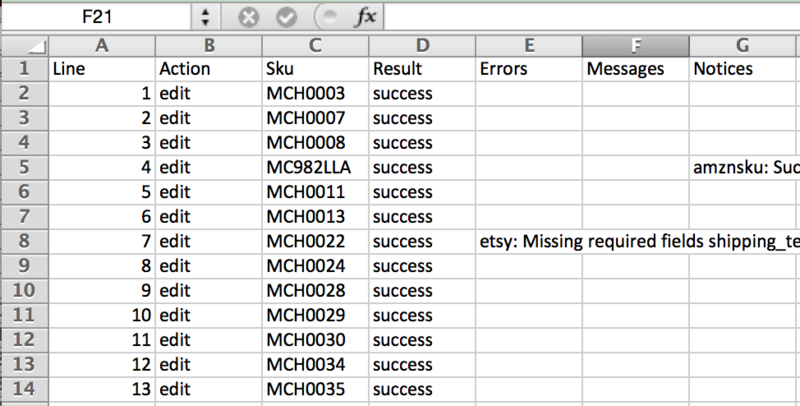 Now that you've successfully uploaded a product edit and checked the results. Go back and fix any erros in your upload before moving on. You'll want to make sure that you can edit products successfully before trying to add products from scratch. Once you've got that down, the next guide will explain how to Upload Images to Products in Bulk.